This window is presented upon startup if there were tasks scheduled that were missed while Tixati was not running. 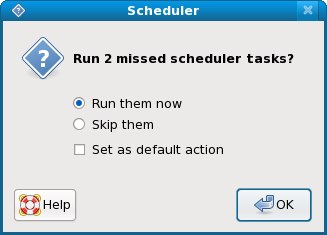 If you select 'Run them now', the tasks will be run in chronological order. If it has been several days since the last time Tixati was run, some daily or weekly tasks may run multiple times to simulate what would have happened if Tixati was running the whole time.